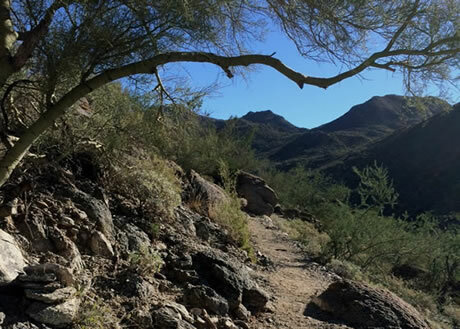 Sustainable trail design through the desert. Winding route and rest spot beneath giant spruce. Rock retainer and bridge in the Rockies. Rugged trail through remote wilderness. Accessible trail through lowland marsh. Rocky trail through scree and tundra. The USDA Forest Service Standard Trail Plans and Specifications are for the design, construction, and maintenance of National Forest System trails and trail bridges. These plans and specifications also are available for other Federal, State, and local agencies, communities, trail partners, volunteers, and entities. 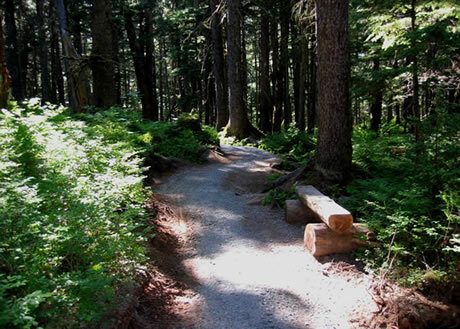 The Standard Trail Plans and Specifications reflect current Forest Service trail management efforts and the agency’s Trails Data Dictionary for constructed features and tasks. 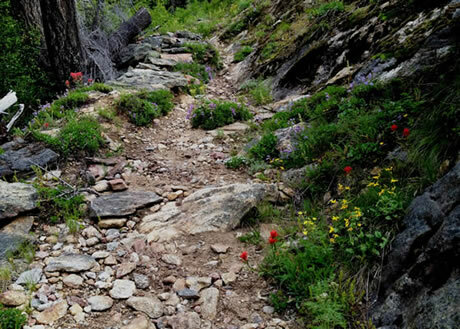 The Forest Service’s National Technology and Development Program (T&D) developed them in conjunction with the agency’s National Trails Program, with funding and support from the Federal Highway Administration, Recreational Trails Program. 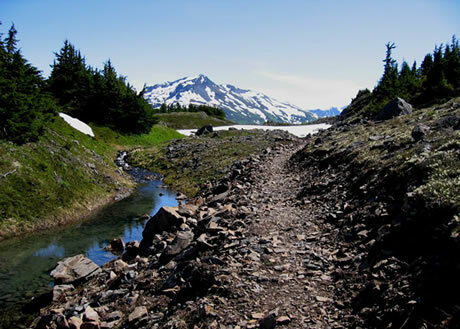 These Standard Trail Plans and Specifications supersede the 1996 USDA Forest Service, Standard Drawings and Specifications for Construction and Maintenance of Trails. Specifications are written requirements for performing work. Pay Items are specific items of work for which a unit and price are provided in a contract. The Standard Trail Plans are comprised of Standard Trail Drawings that show the location, type, dimensions, and details of trail work. The Standard Trail Plans are provided in United States customary units and are available below as PDFs (portable document files) and AutoCAD files. In AutoCAD, when using a postscript printer, this STD.ctb file should be used so line weights print as displayed (STD.zip). The Standard Trail Drawings are to be used as-is, with trail and site-specific dimensional needs additionally recorded on each sheet. If the Standard Trail Drawings are modified, the title block must be changed to “Special Project Specifications ” to reflect the change. The Forest Service Standard Trail Plans are available as compiled sets of PDFs or as individual drawings. This section contains standard drawings that are normally included in every trail or trail bridge plan package, such as the title sheet, vicinity map, work list, etc. This section includes standard plans for work items involving earthwork, such as excavation and embankment, clearing and grubbing, surfacing, fords, etc. This section includes standard drawings for work items involved with diverting water from the trail, such as water bars, culverts, ditches, etc. This section includes standard drawings for a wide variety of constructed trail structures, including switchbacks, turnpike, side barriers, puncheon, retaining walls, etc. This section includes standard drawings for work items intended to control and manage trail access, including fences, gates, bollards, etc. This section includes standard drawings for signs, route markers, reassurance markers, mileage markers, and cairns. This section includes standard trail bridge plans for timber and prefabricated steel bridges. 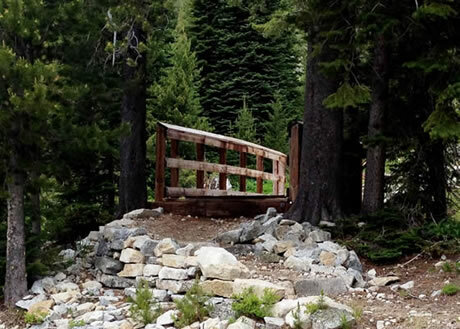 Standard trail bridge plans for timber and prefabricated steel bridges have been approved by Forest Service Washington Office Director of Engineering and Washington Office Director of Recreation for use on National Forest System lands. The standard trail bridge plans are for typical superstructure designs and abutment details commonly used. The plans are not meant to be used as individual drawings. The designer should download all associated plans for the bridge type to ensure they have a complete trail bridge package. A qualified engineer with trail bridge design experience must approve the use of these Standard Trail Bridge plans for each trail bridge project. Proper bridge siting and design includes many other aspects such as siting, hydrology, hydraulics, foundation, etc. Forest Service Trail Bridge design requirements are found in Forest Service Directives Forest Service Manual (FSM) 7723 and Forest Service Handbook (FSH) 7709.56b, Chapter 80 and in Technology and Development Center’s publication “Locating Your Trail Bridge for Longevity”. On Forest Service projects, these plans may not be modified without Regional Engineer approval (except for populating the Structure Table on page 1 for each bridge type). Non-Forest Service entities are welcome to use these trail bridge plans, but must take full responsibility for their use. We further recommend they seek review and approval from their qualified engineer of record for the project. Trail Bridge Plans are provided below in a combination of editable AutoCAD .dwg and non-editable .dwf formats. Regional Bridge Engineers retain editable .dwg versions of the AutoCAD .dwf plans provided here. This section does not include any standard drawings, but is reserved and used for the identification of specialty structures in project packages, such as tunnels, snow sheds, etc. Refer to Specifications Section 970 - Specialty Structures. This section includes standard drawings for work items that are considered incidental to major work items, such as seeding, fertilizing and mulching, removal of structures, etc. This section does not include any standard drawings, but includes material specifications used for work items included in project package. Examples include aggregate, rock, geosynthetics, material for timber structures, etc. Refer to Specifications Section 990 - Materials. If you have questions or comments, please contact FS-Trail Management at: fstrailmanagement@fs.fed.us. These Standard Trail Plans and Specifications were revised and developed with extensive involvement and expertise from Jonathan Kempff, P.E. (Professional Engineer), Forest Service National Trail Technical Team; and James Scott Groenier, P.E., and Deb Mucci, Draftsperson, both with Forest Service Technology and Development Program. 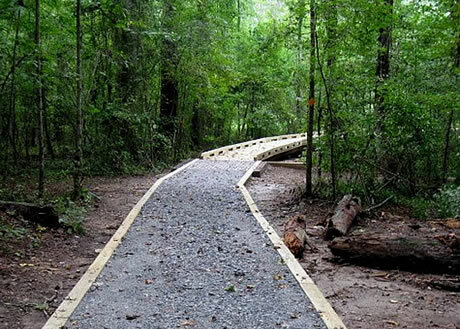 This project was sponsored and funded in large part by the Federal Highway Administration, Recreational Trails Program. The Forest Service, an agency of the U.S. Department of Agriculture (USDA), has developed this information for the guidance of its employees, its contractors, and its cooperating Federal and State agencies. The Forest Service assumes no responsibility for the interpretation or use of this information by anyone except its own employees. The use of trade, firm, or corporation names is for the information and convenience of the reader. Such use does not constitute an official endorsement or approval of any product or service to the exclusion of others that may be suitable. These materials were produced in cooperation with the Recreational Trails Program of the U.S. Department of Transportation’s Federal Highway Administration in the interest of information exchange. The U.S. Government assumes no liability for the use of information contained in this document. The U.S. Government does not endorse products or manufacturers. Trademarks or manufacturers’ names appear in this report only because they are considered essential to the objective of this document. These materials reflect the views of the authors, who are responsible for the facts and accuracy of the data presented herein. The contents do not necessarily reflect the official policy of the U.S. Department of Transportation.